Following my great experience of racing on the road for GB in Germany at the Trofeo der Gemeinde Gersheim I was on the lookout for some more road races that I could do in addition to the MTB calendar. 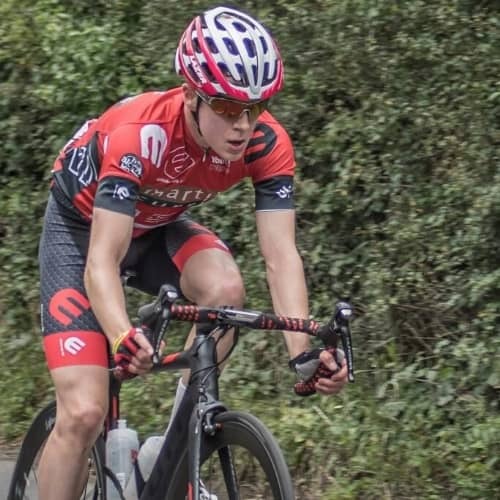 The British Junior Road Race Championships in Oxford fell on a free weekend so I had no second thoughts about giving it a go. My dad and I travelled down from Edinburgh the day before the race and upon arrival I had plenty of time to have a ride on the course. The course was fairly undulating with a few small climbs which could affect the race and as I was riding I was aware that the wind, if blowing strong, could play a major role in the race due to some narrow and exposed roads. However with this road race being only my second of the year and my first in the UK, I was unsure how the race would play out over its 115km duration. So on race day I was very concentrated on making sure that I was attentive and well positioned at the beginning of the race so that if anything significant happened I was there to respond. I executed this plan well but in actual fact the start was fairly relaxed with only a few riders trying to escape. In the early stages there were some pretty large breakaways forming which I was beginning to get a little worried about. My legs were feeling good so on a couple of occasions I tried to attack but I was always followed and marked by riders at the front of the bunch. As the race progressed into its middle stages I managed to sneak away a couple of times with some other strong riders but the bunch was quick to react so the moves where short lived. As the race entered the final 50km the terrain began to become much more challenging with two times up the same difficult climb. There was a breakaway up the road with a gap of around two minutes however the favourites in the bunch were likely to light things up on this tough climb to pull things back together. Going into the climb for the first time I made an attack just before the climb on the flat to gain a small advantage which would act as a buffer for when the attacks began. This worked well as I was able to cruise up the climb and then going over the top was joined by a few riders lead by pre-race favourite Tom Pidcock. A small group of us then worked well together managing to bring the break back in around 10km creating a large lead group of around 15 riders. Cooperation in this group wasn’t great, but neither was it back in the bunch so the gap remained at around a minute. On the final time up the climb the pace was really ramped up by Pidcock leading to a selection being made of six riders which I managed to make. Finding myself in this situation gave me an extra boost of adrenaline to continue fighting. The six of us worked fairly well together and built up a comfortable gap on the chasers. In the final 3km the attacks began and they were non-stop: the final 3km felt like one long maximum sprint. I pushed as hard as I could but ultimately could not respond to the winning attack of Louis Rose-Davies from 1km to go but was still able to sprint into 5th position. Although I had come so close to the podium, and the win, I felt very little frustration with my result. I was really pleased with how I rode the race and that I proved I was one of the strongest riders in the race. As a first year in the category and with little experience in this type of racing I didn’t know what to expect so I am really happy with what I achieved.